I would like to take a short break from sharing Selwyn Hughes thoughts on “Is God Good.”? and also on promoting the now public availability of Risen! 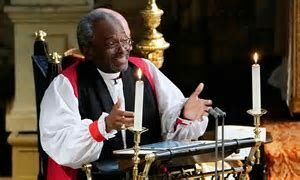 The Musical on YouTube (https://youtu.be/wYUX1CQEjoY) The reason for this is that I, like many other millions, was enthralled by the speech of Bishop Michael Curry at the Royal wedding of Prince Harry and Megan Markle. “When love is the way, we will lay down our swords and shields, down by the riverside, to study war no more. “When love is the way, there’s plenty good room – plenty good room – for all of God’s children. “When love is the way, we know that God is the source of us all, and we are brothers and sisters, children of God. “My brothers and sisters, that’s a new heaven, a new earth, a new world, a new human family. “You can see further through a tear than you can a telescope”. This entry was posted in Ken Shearsmith's Blog on May 24, 2018 by Risen Webmaster.